Certain heart problems can be addressed in a minimally invasive manner by accessing the heart and internal blood vessels through peripheral blood vessels in the neck or leg, rather than opening the chest. Fluoroscopy, which uses X-rays to create video images, provides real-time guidance of movements through the heart and vessels. These procedures are the treatment of choice for many patients in human cardiology and are also available for pets. Specific cardiac diseases treated by interventional procedures include congenital abnormalities, such as patent ductus arteriosus and valvular stenosis (narrowing), abnormally fast heart rhythms, and excessively slow heart rhythms. These procedures can restore normal life expectancy and quality of life to patients with important heart disease. When persistent after birth, a patent ductus arteriosus (PDA) represents an abnormal vascular communication that overloads the heart by allowing blood to flow directly from the aorta into the main pulmonary artery. Treatment involves stopping blood flow through the PDA. Just as in people, a minimally invasive procedure is available to occlude the PDA from within. Access to the defect is obtained from a vessel in the leg, and a small occlusion device is placed in the PDA to block the abnormal blood flow. 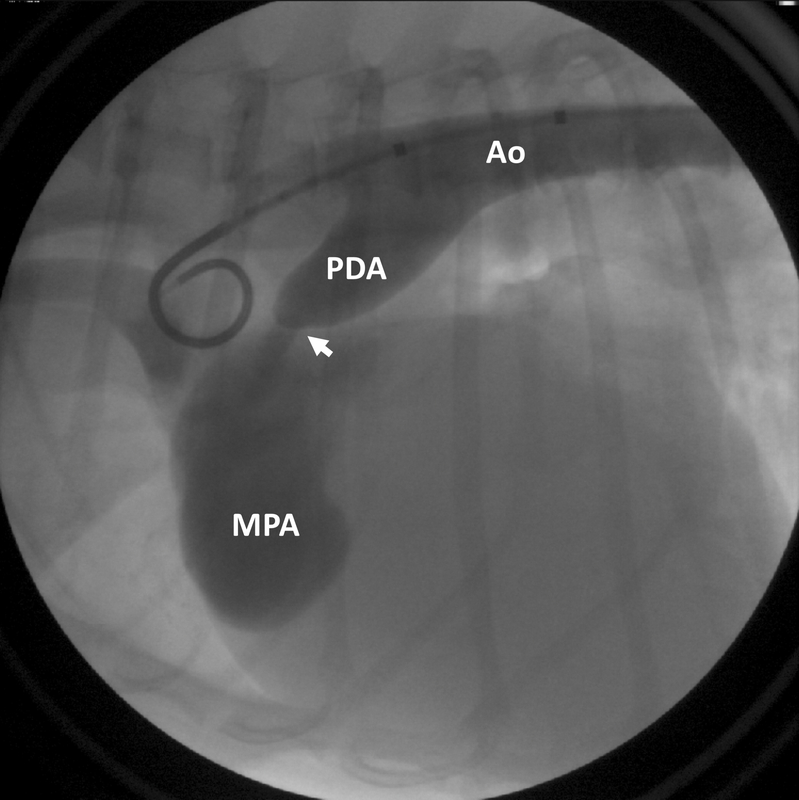 Figure 1: Contrast is injected into the aorta (Ao), highlighting the patent ductus arteriosus (PDA), as well as abnormal blood flow beyond the PDA (arrow) into the main pulmonary artery (MPA). 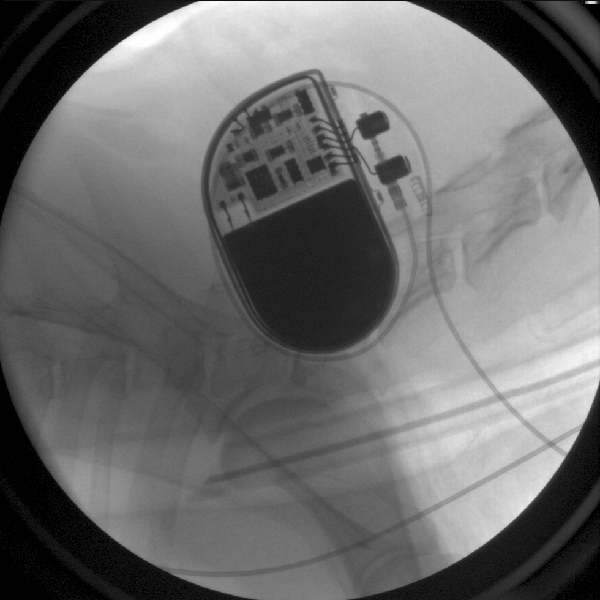 Figure 2: A PDA occlusion device has been placed in the PDA. The device remains connected to the delivery cable and can still be removed from the body if needed. 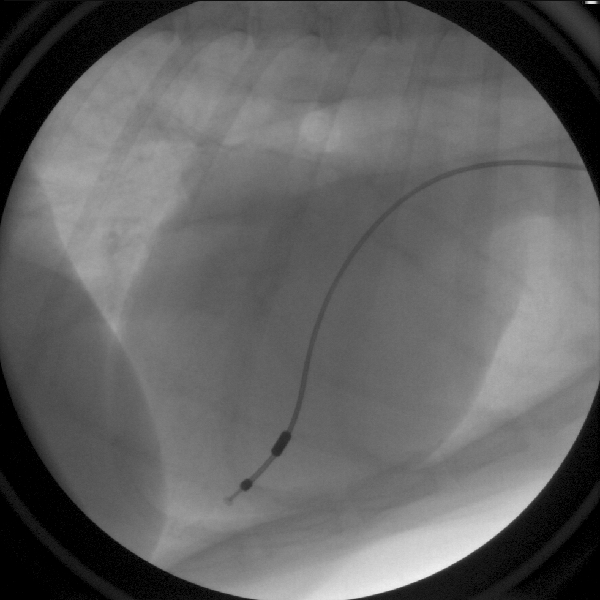 Figure 3: Contrast is injected into the aorta following device detachment from the delivery cable. The PDA occlusion device has completely stopped abnormal blood flow through the defect. 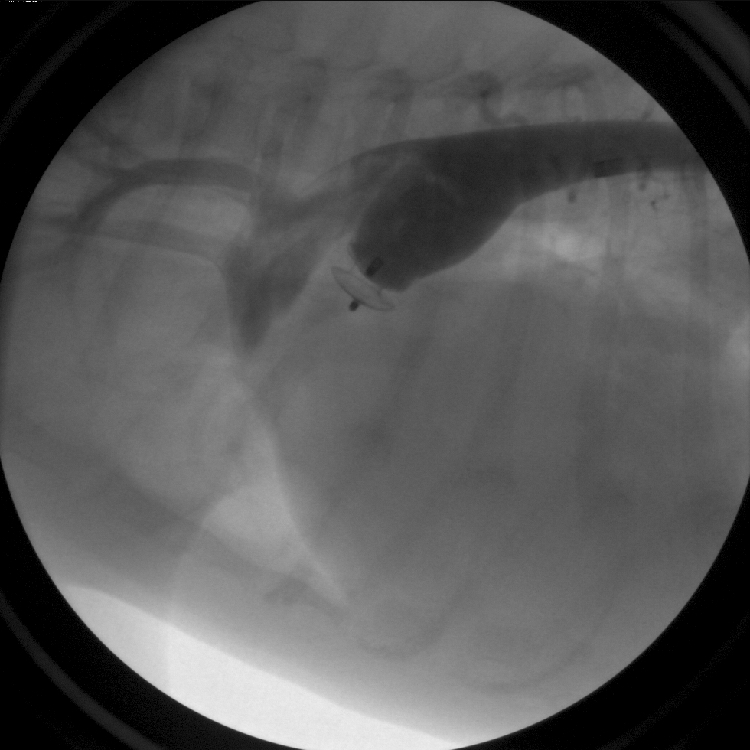 Figure 4: Post-procedure radiograph with appropriately positioned PDA occlusion device. 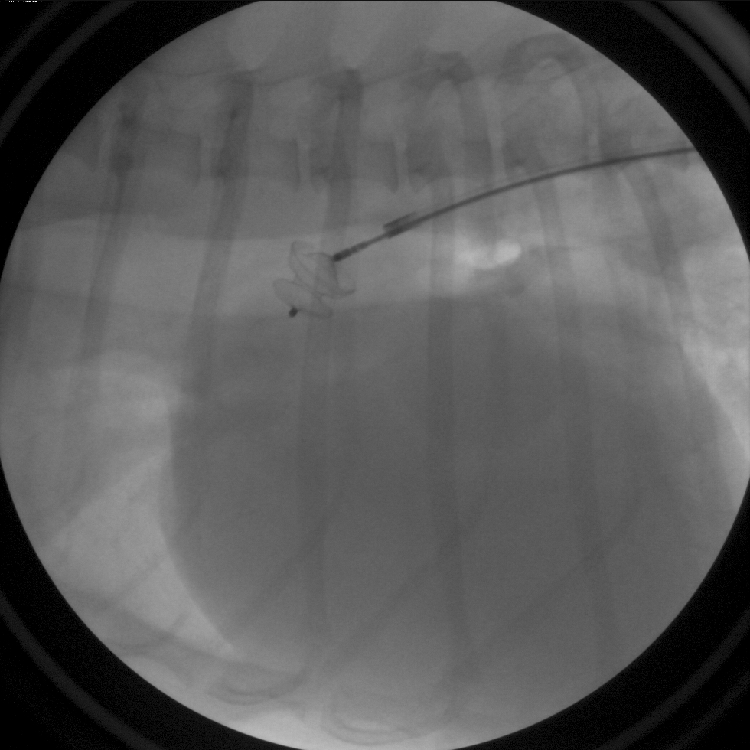 The PDA occlusion device can be seen attached to the delivery cable (inset). Valve stenosis (narrowing) causes an obstruction to forward blood flow. 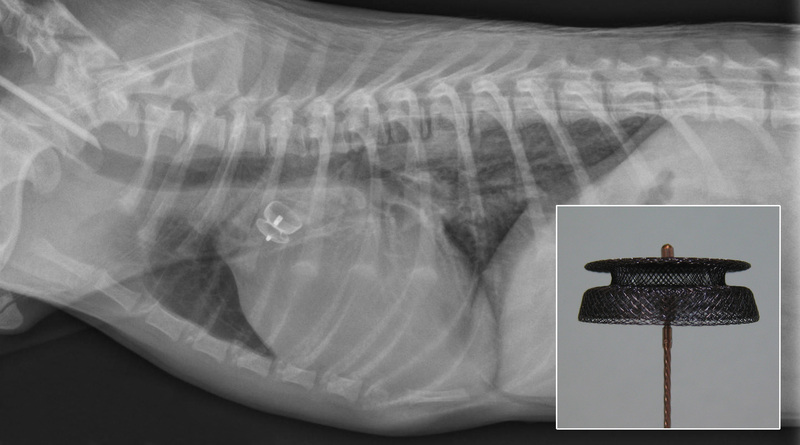 This can be relieved by balloon valvuloplasty, whereby a balloon is inflated across the narrowed valve to dilate the obstruction. This is most commonly performed for pulmonic valve stenosis, in which a narrowed pulmonic valve opening obstructs blood flow from the right side of the heart into the lungs. 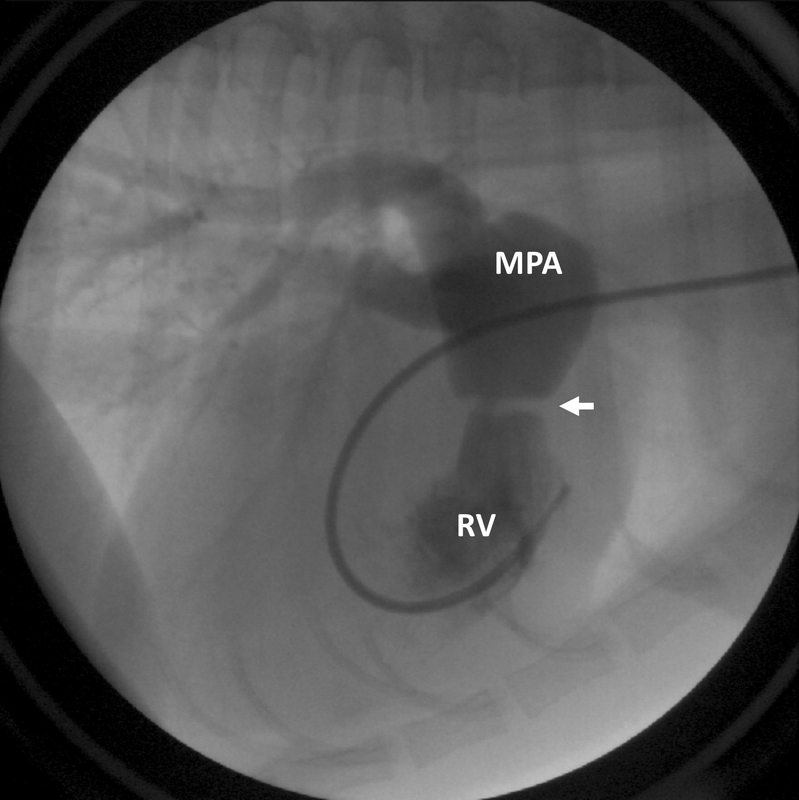 Figure 5: Contrast is injected into the right ventricle (RV), flows into the main pulmonary artery (MPA), and then out to the lungs. A discrete narrowing of the contrast column (arrow) indicates an obstruction at the level of the pulmonic valve. 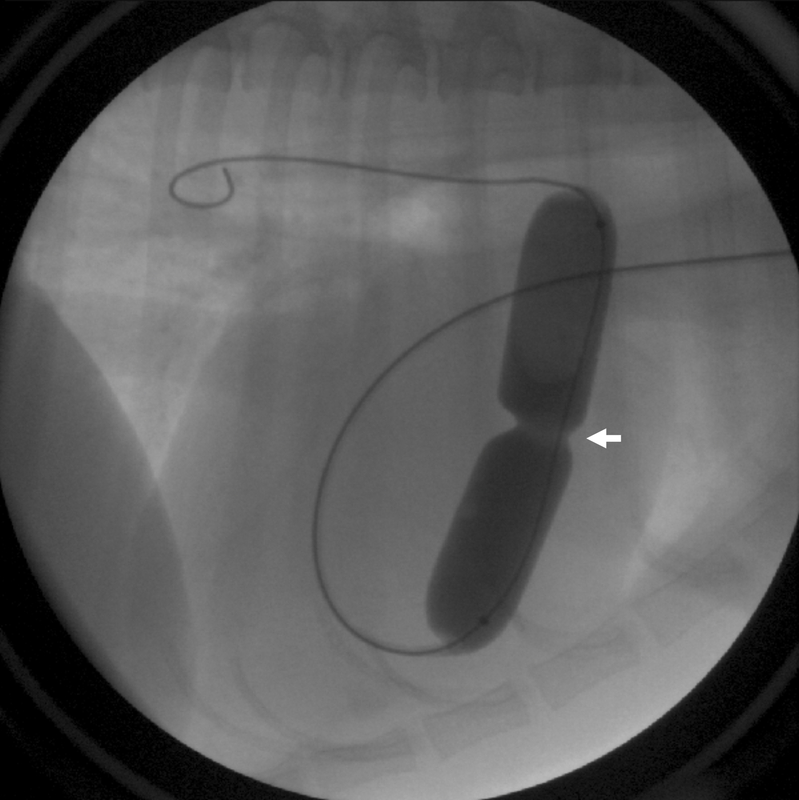 Figure 6: A balloon catheter has been advanced from a vein in the neck, into the right heart, and across the defective valve. The balloon is inflated with diluted contrast, creating an indentation at the level of valve narrowing (arrow) that is subsequently dilated upon full inflation. Arrhythmias that are characterized by excessively fast heart rates can compromise proper heart function and lead to heart failure. In certain patients, this is due to an abnormal electrical pathway (accessory pathway) or a focal area of electrically overactive heart muscle cells. Electrophysiologic studies utilize electrode catheters to map the electrical characteristics of the heart muscle and precisely locate the site of electrical abnormality. Radiofrequency energy is delivered to the abnormal tissue via an ablation catheter (radiofrequency catheter ablation) to make the site electrically inactive and provide a permanent cure for the arrhythmia. 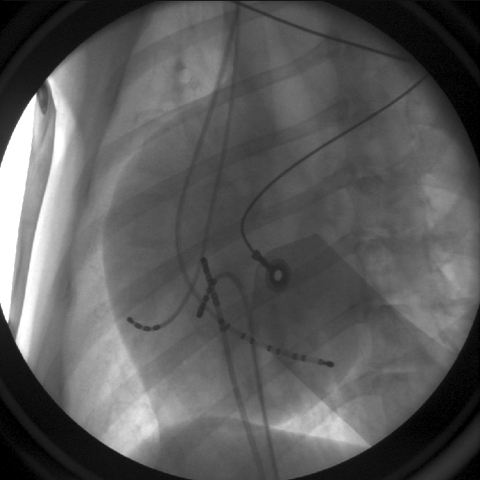 Figure 7: Multielectrode mapping catheters have been placed within the heart as part of an electrophysiologic study. Problems with the heart’s electrical system can cause very slow heart rates. A pacemaker can be implanted to keep the heart beating regularly at a normal heart rate, thereby preventing sudden death, collapse, congestive heart failure, lethargy, and exercise intolerance in these patients. Today’s pacemakers are small and are inserted under the skin. The pacemaker is connected to the heart by a thin “lead” that is advanced through a blood vessel in the neck down into the heart. The pacemaker feels like a small bump under the skin but is often visually unnoticeable. Figure 8: A pacemaker has been placed underneath the skin in front of the shoulder, and it’s lead travels through a vessel in the neck into the heart. Figure 9: A pacemaker lead is in contact with the heart muscle inside the right ventricle.